We shot a lot of spherical panoramas in various parts of the globe: these panoramas are often complex and unique and allow the viewer to visit the most interesting and inaccessible places on our planet. In addition, our viewer can look at the sights from the most incredible angles that were previously simply not accessible. But so far nobody was able to make a spherical panorama with a 3D image. It is well known that in order to make a 3D image you need to use the parallax. That means you have to look at the object from two different points. People have the ability to see their surroundings in 3D due to his two eyes. Because of the small distance between the eyes, an average of about 60 mm, a person can determine the distance between himself and the objects and can see 3D objects from a short distance. If the distance is more than ten meters everything seems a bit "flat" and the distance to the object is determined indirectly by comparing it to the size of other known objects. This is why it is very difficult to determine the distance in a desert or a prairie. Parallax is the worst enemy of a photographer during panorama shooting and editing process. On one hand you need parallax in order to get a 3D image, on the other hand it is our enemy. These are two mutually exclusive conditions. Nevertheless, we managed to solve this seemingly unsolvable problem! First of all, you need to understand some limitations. When shooting a pair of stereo images, R and L (Left, Right), you can't achieve a superposition of zenith and nadir. The picture clearly shows that nadir and zenith simply do not have a pair. Supposedly we shoot the stereo pair in the upper position: when we rotate it 180 degrees, R and L, and L and R have to be matched in nadir and zenith. After some thinking we figured out a more intuitive solution and decided to use nadir from one panorama into another panorama! When you have a smooth surface it's an ideal solution. Zenith is usually the sky and serves as a long shot, i. e. there is no parallax in zenith. For nadir you need to choose a flat surface. The remaining problem is how to shoot from two points with parallax that is necessary for stereo images and match individual images where parallax is not needed at the same time!? Some school level math helped us out. When calculating the perimeter of circle you can measure the length of the short chords. 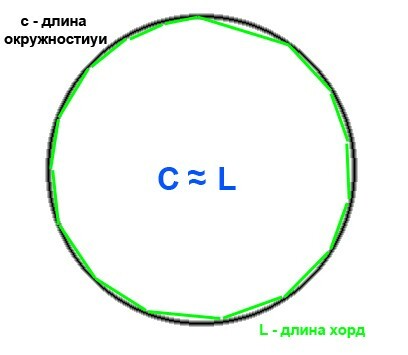 And the higher the number of chords, the more accurate your measurement of perimeter of the circle will be. If you increase the number of images for improved accuracy you can shoot spherical panorama with parallax. This is how we did it. We shoot the first series of panoramas without parallax. Then we move the camera head for parallax (the tripod needs to be still at all times). In this case, we moved the head to the right. 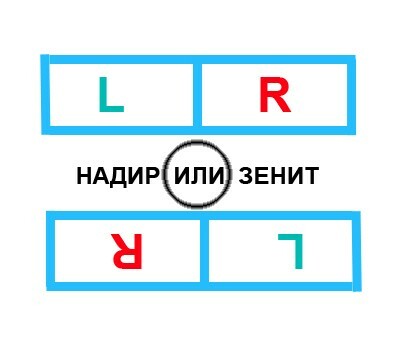 The first series of photos for the cylinder have been marked as L - left eye, and the second series that has been moved to the right was marked as R - right eye. During the editing process we edit the photos from the L series as ordinary panoramas because they have no parallax. Then we do the R series and match respective images to the L series. The larger the image the better. In this example we used 50 mm shift. The stereo effect is seen at distances of less than a few tens of meters. The subject for panorama has to be without extended objects. This way it will be easier to match images with parallax. If some time has passed between shooting the L and R series clouds can "get away". It is better to choose the moment with less clouds in the sky so the sky stays the same all the time. If there are clouds in the sky at the time of shooting, the only solution is to use the sky from the L-series in the R-series. As the sky is the long shot that has almost no parallax, such subtle change of the sky should not affect the final result. 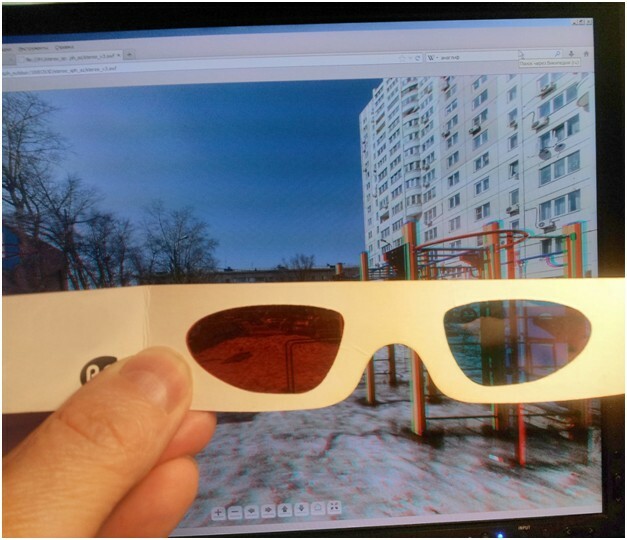 It's easier to use anaglyph image to view stereoscopic image. You can match two images into one with free Z-Anaglyph application. And there you go, panorama is ready! Some color defects that occur when using this technology are compensated by simplicity, low cost, and availability. Now take your glasses and start viewing our spherical panorama. We recommend to view it in high resolution. For slow Internet the low resolution panorama can be opened.